We really like the colors and quality of this quilt, it's really warm and fits perfectly with our southwestern them decor. I would definitely buy again. Featuring a stylish and colorful southwestern pattern, this handsome quilt set is a fantastic way to update the decor of your bedroom. The set is available in a wide variety of sizes to ensure you can find on that works for your specific needs. Dimensions 17.0 In. X 14.0 In. X 4.0 In. The look of this quilt is bold and bright. Southwestern quilts are hard to come by under 400$, but this one does the trick. The two pillow shams match perfectly. The quilt is fairly thin, but good quality. I looked a long long time to find this southwest design quilt. The colors, design and quality for a reasonable price. I have washed it once and the colors stayed true. Overstock rocks!! Unbelievable value for a gorgeous set! I'm really not sure that I could have gotten anything better for under $750 per set. 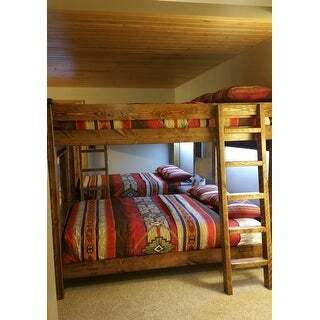 Looks even better in person and we love it for our cabin bunk room! I haven't shopped for quite a while at Overstock. However, I came across this quilt. It is better than the picture. It is more of a heavy coverlet. You can't go wrong. It looks Christmassy but can be used all year long. So impressed I have another color quilt on the way. So happy with this set. Colors are bright and cheerful. The two pillow shams have little bow-ties on the back which are a nice touch. I bought two sets - one for our camper as well. Absolutely beautiful colors. Bedspread is a nice weight for winters, maybe with a blanket on. Stitching is great to not bunch. Shams are beautiful. I ordered a king quilt & the king shams are a bit big but beautiful also. Highly recommend. Looks great on bed . Just the perfect size and color. Machine washable. The price was good. IVery happy with this set.This set it sewn well. I believe it will hold up for a long time. It is over sized more like.old fashion bed spread.It is medium weight. This is one of my best finds. I love this quilt set. The colors are very vibrant and it highlights my bedroom which has more subdued colors. I have a king bed and the dimensions of the quilt are perfect. It is really good quality which I am very happy because I thought it might be flimsy due to the low price. It also washes well too! WOW!!! What a way to brighten up the room. Changed the whole decor. I ordered it, my wife loves it. Cal king was ordered and it goes from the floor to floor on both sides and plenty long enough. Thank you. I love the vibrant colors on the quilt. It is a little lighter weight than I would have like, but for the price, it was an awesome value. Always looking for great Southwest art, and items I spotted this, and bought it in a matter of seconds . When it arrived, I knew I had made a proper choice for me. Love sitting on it , sleeping under it, and how it brightens the room. Well made also. Win win. The colors were as bright as pictured. Only thing I would say, the dark color pictures black, so I ordered black curtains to go in room. The dark color is actually chocolate brown. But it is beautiful in the bedroom. I would order again. I love this quilt set. Perfect weight and size, covers the bed nicely. Quilt Set came just as pictured. Quality is great! I washed it before putting it on the bed. It looks great. So far no complaints! This is a pretty quilt, but I took one star away due to the quilt being pretty thin. Only looks very good when is new after the first wash colors gone . Love it! Great quality. Great price. Yes i would recommend this item to a friend. It is good quality & not too thin or thick. Have been looking for a good size comforter this fits the bill perfectly. Love the color, size, weight and quality. I would highly recommend this to anyone looking for a king size comforter that will cover your bed and your body when you in it! I would highly recommend this set. Looks even better than the picture. Love it! I love this quilt it’s easy to use on the bed the bed makes up easily every morning it doesn’t wrinkle it always looks crisp and I love the colors and quality. Beautiful looks fantastic in my granddaughters room will purchase for my bedroom husband likes the pattern he is very hard to please ! It enhances the bedroom. Bought this for an extra bed room in my home. As well as the pillow covers. Just love how it all fit in. Well be ordering more beautiful things for my home. Exactly what I was looking for. Lightweight, comfortable easy care and dark rich colors. We have a queen bed and I ordered a King size. Its perfect! "When I go to order this bedspread, it offers both a 'beige' and 'red' color option, but there is only one photo. Is the photo the red or the beige? It looks like it would be the red one. Is there a photo for the beige?" Please do not fear ordering the red version of the quilt. 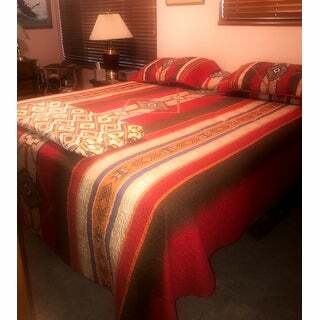 I have the California King - Red, and am very happy finding a quilt that was large enough for the bed. By the way, I do not know what the beige version looks like. I needed the California King size which was listed only in the red version at the time of my order. I hope this helps you. The photograph is for the red version quilt. I purchased the California King and am pleased with the color and dimensions. "Does this have a vibrant red? I want to buy this, but reviews have me scared bc they are saying the red part is brown." 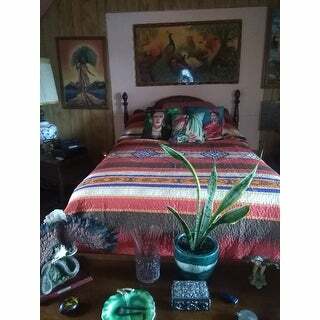 The photo of the southwest quilt set is a good likeness of the quilt. I hope it helps. I don't know what the beige looks like because I bought the red and yes, it is vibrant. a perfect red and a very beautiful set. no brown. soome reviews say it's not a heavy quilt and it's not but I bought for a bed decorating quilt, not for warmth and I have no regrets. it's gorgeous. "What are the dimensions for a Cal King? Is that the same as a King?" Here are the dimensions: King dimensions: Quilt: 106 inches wide x 90 inches long -- Two (2) Sham: 20 inches wide x 36 inches long Super King/ Cal king dimensions: Quilt: 106 inches wide x 118 inches long == Two (2) Sham: 20 inches wide x 36 inches long The California King sized bed is usually wider than the normal king size bed. "I love the looks of this quilt but need a queen and a twin. Is there any where to buy a twin size??" Unfortunately no, the twin size is not available. You may want to scroll to the "Frequently Bought Together" items. On Jan 07, 2019 the twin sizes are posted there. I hope this helps. "The instructions say washable. What about drying?" "Can you order extra shams? Are there any matching pillows"
I ordered the set for my Brother-In-Law and I ordered the twin . That only comes with one sham . The others come with 2 and I haven't seen where you can order extra shams . However , with that being said , I would actually order another complete set ( for back up ) as this is absolutely a beautiful bedding set ! Hands down , the colors are brilliant and I am sure you would not be unhappy with this purchase ! I 've had this quilt for awhile. Once in awhile I sneak a peak to see the selling price at a given time. I have never seem shams or pillows offered separately from the entire set. So I would say that the answer to your question would be no. "Does this quilt come in Super King? It does not say so on the sizes." The Southwest quilt is listed as cal king because super king is not currently an available option. We will be updating that information shortly. The quilt set is available in a Super King/ Cal king dimensions: Quilt: 106 inches wide x 118 inches long -- Two (2) Sham: 20 inches wide x 36 inches long. I hope you enjoy the quilt as much as I am.